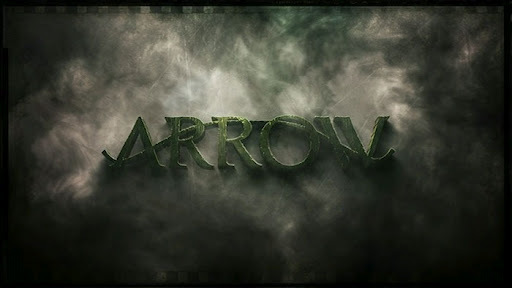 Back of the Head: Arrow 1x18 - "Salvation"
The Glades are now vitally important to Arrow as the future battleground of the fate of Starling City. The issue this week is Helena Bertinelli not being the only person "inspired" by the "example" of the Hood taking "justice" into his own "hands" (wait, "hands" didn't need quotation marks. Well, it did the second time). By the way, "Salvation" is confused about its own timeline. When Diggle took Oliver out to dinner - at Big Belly Burger, natch, because where else would they eat? And where is Diggle's ex-sister in law? She hasn't been seen since they hooked up weeks ago - Diggle said Oliver's been throwing himself into his work as The Hood since McKenna was shot. They established this happening two weeks ago. At the end of the episode, Laurel tells Oliver her mom has been in Starling City "this week", but she arrived in town even before Helena did. Maybe time passes differently for Laurel in the Glades. So, back to the Glades. A new vigilante has emerged calling himself The Savior. The Savior's crusade is to bring the people who have failed the Glades to justice, and he does so via kidnapping and public executions. The Savior has super awesome tech: he can have his video feed stream live to every smart phone in Starling City somehow (local news handles the TV broadcast), and his tech can even elude Felicity's cyberocity. How does The Savior have access to this kind of technology? Never mind. What's important is who he's kidnapping: slumlords and gang bangers who have made The Glades not such a fine place to live. Oliver fails to stop two executions, no matter how sure Felicity is of The Savior's location and no matter how much parkour Oliver uses to dance across Starling City's rooftops. (Note also, when Diggle asked if Oliver's "gonna Hood up", Oliver replies, "Not during the day!" Never really noticed that The Hood is only a grim, avenging creature of the night before, but that makes sense.) Poor Felicity took it really hard when she was flummoxed by how The Savior keeps changing his location and evading her cyber-stalking. We also find out she isn't dating anyone. Hmmm. Meanwhile, Thea is happily discovering Roy Harper's arsenal of make out moves (forced, I know). She also discovers Roy, who totally blew off a decent job Thea arranged for her as a valet at Verdant, is very much a gang banger. She learns this when their liplocking is interrupted by the delivery of a pistol. Roy's planning on a liquor store hold up, but it's okay because "the guy's a jerk". Thea doesn't feel any better or safer when Roy removes the bullets and she vamooses because this guy is trouble. But of course, she likes him, even when Laurel advises her to run away from the bad boy. Little do Thea or Roy know that Roy is The Savior's third target. I mean, Roy Harper must be the most dangerous, violent gang banger in the Glades if The Savior targeted him third of all the bad people who must be in the Glades. Thea gets KO'd on the street as Roy is abducted, and she runs to Verdant to watch Roy's televised execution with Tommy ("Hey, I know that guy!") Oliver grimly promises his sister nothing will happen to Roy Harper, a guy he's never heard of until now, and before Thea can ask the logical question of "how can you possibly promise that? ", the Hood is on the case. Finally, Sharp Ears Diggle and Clever Felicity figure out how The Savior keeps changing locations: He's on a subway car going through the tunnels under the Glades. The Hood heads underground and successfully saves the life of Roy Harper. The Hood's face off with The Savior has some curious dialogue about how The Hood insists he's nothing like him when, well, he kinda is, except for the public executions. The Savior really loses points when he said, "I grew up in the Glades too, but I'M not a criminal!" Uh, what? Whatever, The Savior has still failed the city and takes an arrow through the torso. Roy Harper lives and is reunited with Thea. He also kept one of The Hood's arrows as a souvenir. Foreshadowing. I liked Oliver's attempts at consoling Felicity the best. She still has trouble justifying Oliver's killing and this Savior case where she had to watch a man die rattled her since she's never seen someone killed before. She can occasionally be distracted by the sight of shirtless, jacked Oliver doing those ridiculous pull ups, but remember how she said she's only part of this operation as far as finding the missing Walter Steele? Seems like everyone's forgotten all about that. Since Felicity lives alone and has no friends who don't work in the Arrow Cave or a significant other, she has no one to talk to about her days. Oliver says, "If you ever need someone to talk to you about your day, you can talk to me." Aww, that's sweet. Except, Oliver, you're the CAUSE of her day. Another thing I liked was my realization that the green V of the Verdant logo is a green arrow that points right to the Arrow Cave. It's here, everyone! Right here in plain sight! The Lance family drama came to a head this week. Laurel was simply appalled at the sudden reconciliation of her estranged parents and their united front in trying to find Sarah. Laurel decides it's time she intervenes and proves her sister is dead, so she researches that photograph of "Sarah" wearing a hat on the Island of Salvation, and she learns that it's a totally different person, whom she magically got to appear in her law office soon after finding her. Mrs. Lance didn't take it well, and after some teary drama, she confesses she knew Sarah and Oliver were sleeping around behind Laurel's back and she let her go on that fateful yacht cruise with the Queen men. Then Mrs. Lance catches a plane back to Central City (! ), and you know how fast those newfangled airplanes are: She'll be there "in a Flash". Ooof. Malcolm Merlyn has recovered from his failed assassination attempt and to Moira Queen's chagrin, he's hellbent on finding out who put the hit out on him. Moira is peeing herself and shitting bricks as Malcolm tells her he paid off a member of the Triad to find out who the culprit is. Gulp. Moira's a goner. She meets with her accomplice Frank Chen in an alley and Frank gets two black arrows in the chest. The Dark Archer has struck, and Moira puts it all on Chen as the sole person behind the heinous assassination attempt on our beloved Malcolm Merlyn. Moira dodged a bullet, er, arrow, this week but she seems to be on borrowed time. Five years ago on the Island, a trade off between Slade (who is short), Oliver and Fyers of the missile launcher circuit board in exchange for a boat off the Island goes south real fast. Fyers brought along Yao Fei and has no intention of providing a boat. Rather, he'll executive Yao Fei's daughter Shado if Oliver doesn't hand over the circuit board. (Which his men stole anyway.) This ends in fisticuffs as Oliver, Slade, Yao Fei, and Shado make short work of Fyers' men. Shado hilariously smacks Fyers around like he was Loki and she was the Hulk too, and it turns out she can speak English and knows Fyers' plan. Speaking of plans, Team Arrow finally figures out a big clue to whatever the big master plan is involving the Glades: the subway map beneath the Glades matches up to the symbol in the Book that has The List. So what is it? Bombs under the Glades? A nuclear device? Or maybe it's a machine that weaponizes a fear compound so that everyone who breathes it in goes insane and the people of the Glades will destroy themselves and the Glades? Or maybe it's from the plot of a different Batman movie? We'll find out soon, Arrow Heads.